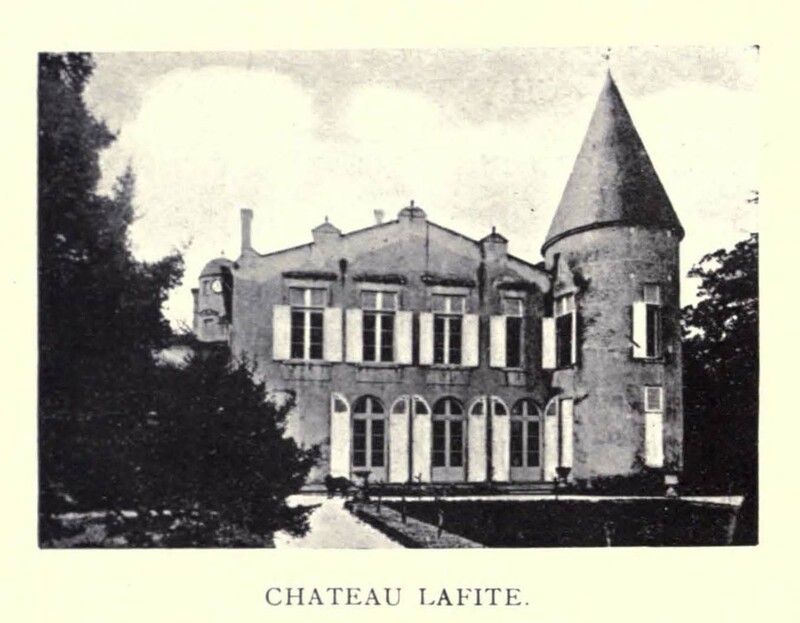 Chateau Lafite was sold on August 8, 1868, to the agents of Baron James de Rothschilds for 4,440,000 Francs. During the sale the heirs of the original owners reserved the right to sell the furniture in the chateau and the wines in the cellars. That fall the spectacular sale of 36 vintages in bottle and one in wood took place. This selection represented a period of 69 years from 1797 through 1865 that were stored in the caveau and grand cave. The vast majority of the wine was grand vin though there was also 1815 and 1864 second vin as well as 1859 Carruades. Individual vintages were sold in multiple lots. Details of the sale appear both in Bertall’s La vigne: Voyage Autour des Vins de France (1878)  and Maurice Dubois’ Mon Livre de Cave (1903) . Each author presented the results with some difference so I have combined both to form the three tables below. There are only two reported differences and that has to do with the quantity sold for the 1806 and 1826 vintages. The differences are small and the quantities are within the sale magnitude. The sale appears to have taken place during the first half of November 1868. The sale was conducted by M. Buffard, clerk for the justice of the peace in Pauillac, Charlot, an auctioneer from Bordeaux, and MM. Tatset et Merman, brokers. The wines were sold as-is without any tasting and required a 5 Franc per 100 Franc commission. The bidding was furious and was described as a steeple chase. Within three hours the wines were all sold. 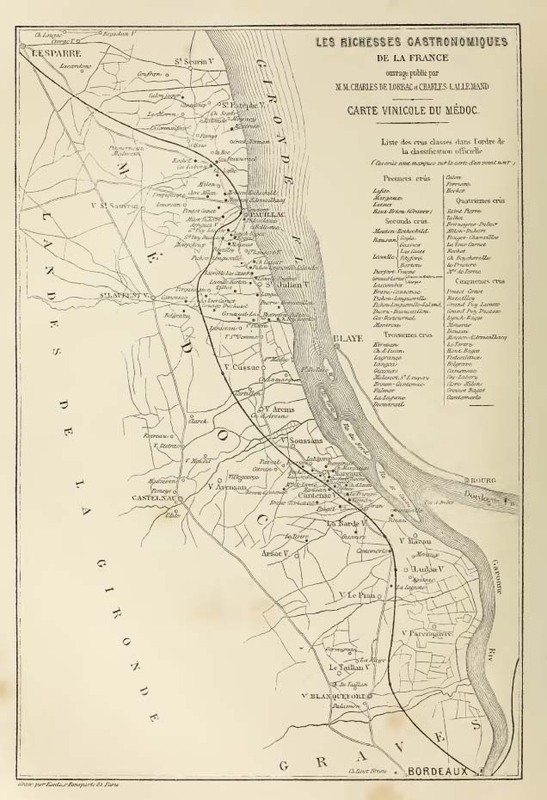 Half of the wines were purchased by Baron James de Rothschild with the remaining majority by M. Gremailly, proprietor of Hotel des Princes et de la Paix in Bordeaux, and M. Delhomme, of Paris Cafe Anglais. The wines purchased by Baron James de Rothschild were returned to the caveau at Chateau Lafite. Those purchased by M. Gremailly were displayed in his very own Le Musee Gremailly. Here the wines were located in a library-like setting, carefully arranged on many shelves. The wines were arranged by vintage and apparently stated their purchase price. The museum remained open through at least 1896 though there were doubts about how drinkable the wines remained. There might have been some published precedent for this doubt to exist. 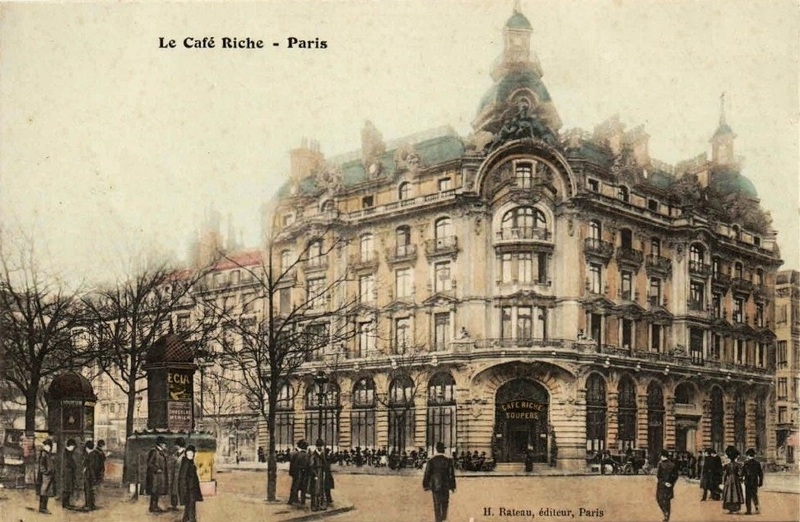 M. Bignon’s Cafe Riche was considered one of the “most celebrated” restaurants in Paris as well as one of the most expensive. Both the cuisine and the cellar of wines were internationally famous. The cellar contained such old bottles as 1811 Cote d’Or and 1819 Sauternes during the fall of 1874. 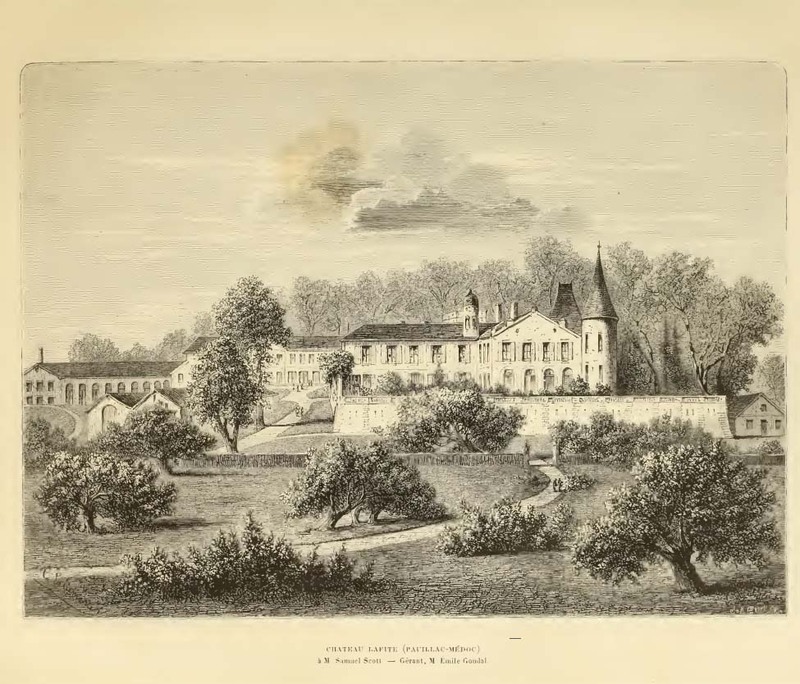 It was only natural then that M. Bignon was present at M. Gremailly’s “rather curious sale” of wine from the cellar of his Hotel des Princes et de la Paix held in 1877. M. Bignon purchased several of these old vintages of Chateau Lafite including two bottles of the 1811 Comet vintage. Whereas this vintage originally sold for 121 Francs M. Bignon paid 320 Francs each. Le Cafe Riche. c. 1890. Image from Wikimedia. Bertall writes that the sale took place after the death of Count Duchatel on November 16, 1868. However the Journal of the Society of Arts published sales results on November 13, 1868. Ray, Cyril. Lafite. Christie’s Wine Publications. 1985. 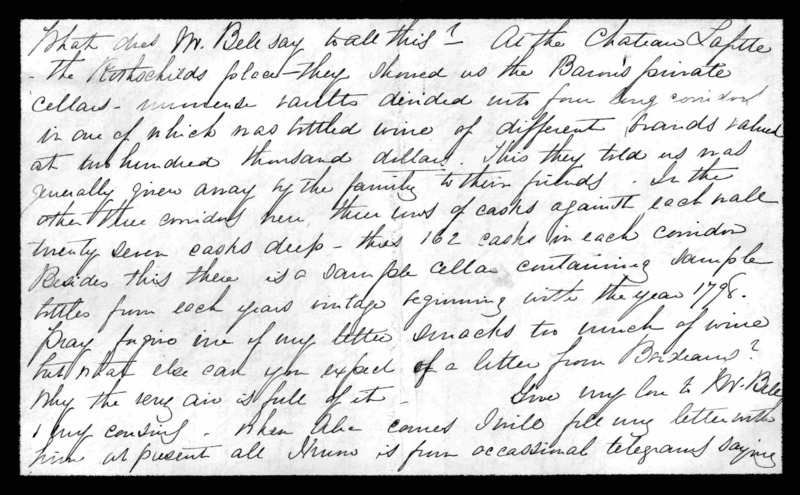 I became rather curious about the origins of chateau bottled wines in Bordeaux after reading Mabel Hubbard Bell’s letter describing the early “sample bottles” at Chateau Lafite. It is quite clear that 1869 is considered the first wine where an entire vintage was bottled at Chateau Lafite. This was the first vintage under the ownership of Baron James de Rothschild who purchased the estate the previous year in 1868. There were earlier vintages that were chateau bottled in part. Exactly how far back this practiced extended has been studied over the years. Cyril Ray wrote that both Warner Allen and André Simon originally believed that 1846 was the first vintage chateau bottled at Chateau Lafite but with the publication of A History of Wine (1961), Warner Allen switched to 1797 as being the earliest chateau bottled vintage without explanation. The vintage of 1797 corresponds with the purchase of Chateau Lafite by Jean de Witt. During the same year of the purchase, Joseph Goudal took over the management of the affairs at Chateau Lafite. De Witt could only hold on to the estate for just a few years before he had to sell it at the end of 1800. This time the estate was purchased by three Dutch negocients. Across this and future sales the Goudal family maintained management of the estate and kept records from which it is known that a small amount of wine was chateau bottled for the owners and staff. It was Joseph Goudal who built the vinotheque in the early 1800s which now houses the oldest bottle reaching back to 1797. Cyril Ray describes this small caveau as “primarily –almost entirely – a museum.” There were some 1,500 bottles as of 1985. Over a century earlier, in 1864, this cellar was also described as “un muse de ses vins en bouteilles”. The collection for this museum of wine was begun in 1798 by Joseph Goudal. The wines were not for sale but buyers were occasionally allowed to taste from them to see how the wines changed over time. At the time the vinotheque or caveau was reported to contain the vintages 1797 through 1834. The later date is of interest because, as we shall see, just several years later the bottled vintages range from 1797 through 1864. The date of 1834 is either a typographic error or stocks from the grande cave were subsequently transferred to the vinotheque. Whatever the range of vintages contained this vinotheque was considered unique in all of France. During the 1868 sale of Chateau Lafite to Baron James de Rothschild the previous owners reserved the right to sell the wine in the cellars. The sale of the wine represented some 5,700 bottles of Chateau Lafite from the vintages of 1797 to 1864. There were also barriques of the 1865 vintage. 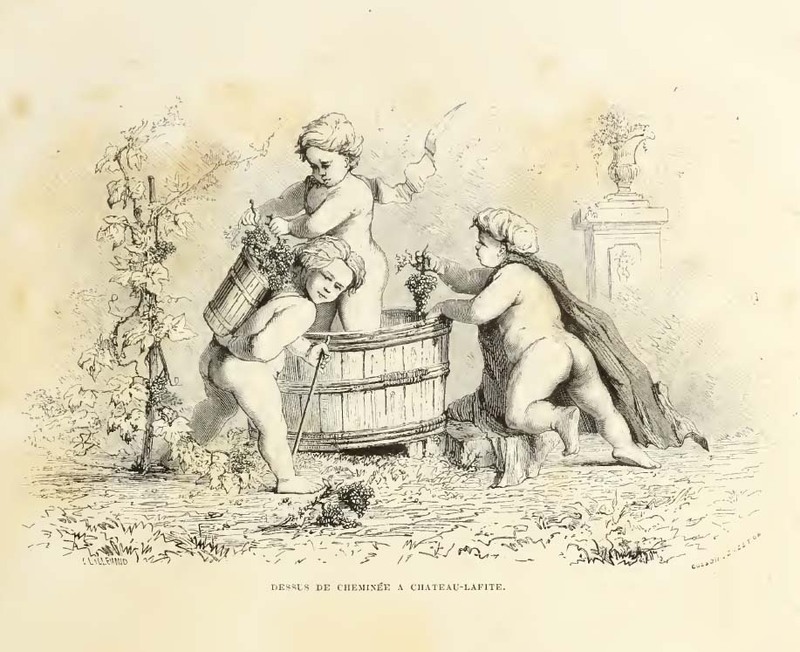 The prices ranged from a minimum of 7 Francs per bottle for 1826 and 1863 to as much as 121 Francs per bottle for some of the 21 bottles of the 1811 Comet year wine. The lots ranged from as few as 6 bottles of 1802 to as many as 817 bottles of the 1864. The few descriptions I have found of this sale do not specifically assert whether these wines were chateau bottled or not. Half of the wine was purchased by Baron James de Rothschild and stored in the cellars at Chateau Lafite. It is Joseph Goudal’s vinotheque then that Francis Beatty Thurber named the “private cellar” with “specimen” vintages back to 1810. Mabel Hubbard Bell described this space as the “sample cellar” with vintages back to 1798. Thus we have descriptions of old bottles of Chateau Lafite from 1868 and the 1880s. I find it is curious then that in the 20th century, 1846 was considered the earliest chateau bottled vintage until Warner Allen’s change to 1797 in 1961. Perhaps some history was lost or there was not yet proof that the 19th century descriptions applied to chateau bottled wines. Even the definition of chateau bottled could have changed as well. Shortly after Clarets and Sauternes was published an interesting article exploring chateau bottling titled “Mise en bouteilles au Chateau” appeared in Le Sommelier during 1924. 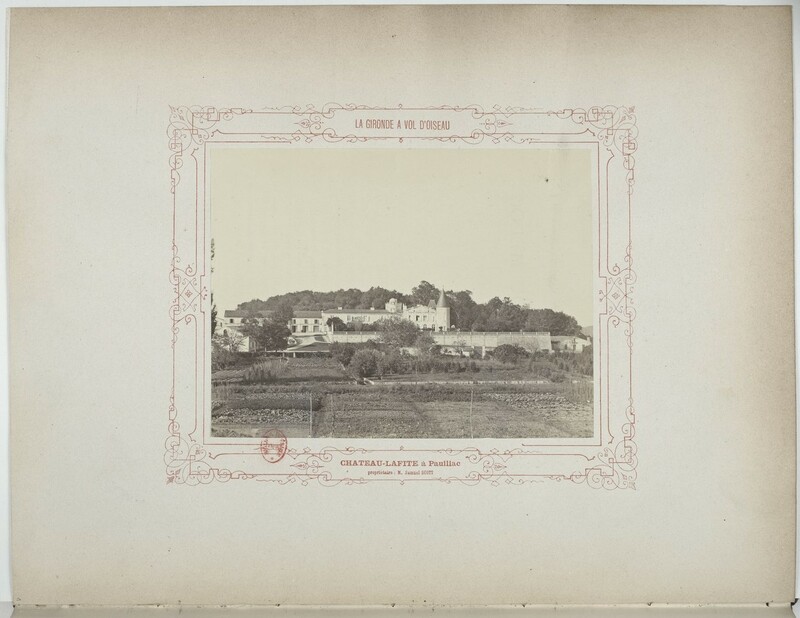 The article begins by stating, contrary to popular opinion, that Chateau d’Yquem is considered the first to chateau bottle the entire vintage, that being 1865, ahead of Chateau Lafite in 1869. There is prompt acknowledgement that small lots were bottled at the Chateau Lafite both for individuals and the trade prior to those vintages. 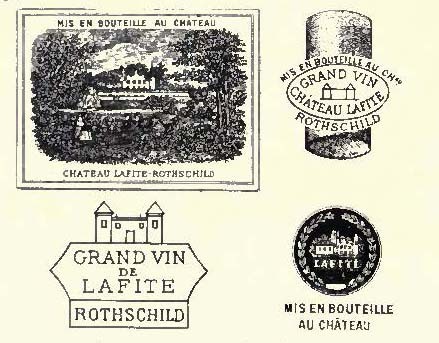 One early example was found detailed in a letter describing the 1811 or “Comet vintage” as being “mis en bouteilles au chateau” and bearing a stamp on the bottle “Chateau Lafite. – M. Goudal, regisseur”. Other vintages bottled at the chateau, with similar guarantee of origin on the bottle or capsule, included 1836 and 1838. The 1837 vintage was purchased “en nouveau” but turned out to be mediocre and was apparently abandoned before eventually being chateau bottled in 1839. Several barrels of 1846 were chateau bottled, a substantial amount of 1847, and at least 50 barrels of 1848 were additionally labeled “grand vin”. While we may never know the sources that Warner Allen and André Simon relied upon it is clear that based on the Goudal documentation the early accounts of the bottled wines in the vinotheque refer to chateau bottled examples. I find this cycle of lost and found history interesting. Whereas the article in Le Sommelier sheds light on Chateau Lafite it also informs us that the use of the terms Mis en bouteilles au Chateau and Grand Vin on wine bottles was hotly debated. At key was the inevitable paradox that a chateau bottled poor vintage represented an authentically bad wine. This would be at direct odds with the great French wines acting as ambassador products in foreign countries. That is a subject for another post. If you are at all like me, you must now be wondering exactly which vintages of old Chateau Lafite were sold in 1868, who purchased the other half of the bottles, and what did they taste like? Coates, Clive. Grand Vin. University of California Press. 1995. We know from other accounts that the bulk of the vintage was sent off of the estate to merchants. It appears then that “sample” or “specimen” bottles of Chateau Lafite were kept from part of the vintage. These bottles were stored in the private cellars and represented vintages back to the beginning of the 19th century. Whether these were bottled at the chateau and the quantity bottled are not yet known. It would be interesting to determine if chateau-bottling, in part, stemmed from the practice of retaining samples. If anyone has further descriptions of the private cellars please let me know! At “Chateau Lafitte” the “Baron’s private cellars” were divided into four longer corridors with “bottled wine of different brands” that were valued at $200,000. These bottles were given away by family to friends. Another cellar contained three corridors with 162 casks per corridor or 486 casks of wine. However, the most interesting description falls to the “sample cellar”. This contained “sample bottles” from every vintage beginning with 1798. Sample cellar seems to imply samples of Chateau Lafite wine. Whether this means chateau-bottle wine instead of merchant bottle wine is not clear. Unfortunately, the number of bottles of each vintage is not stated. Cyril Ray writes that according to records there were no chateau-bottlings between 1885-1906 and that 1876-1885 were the phylloxera years. 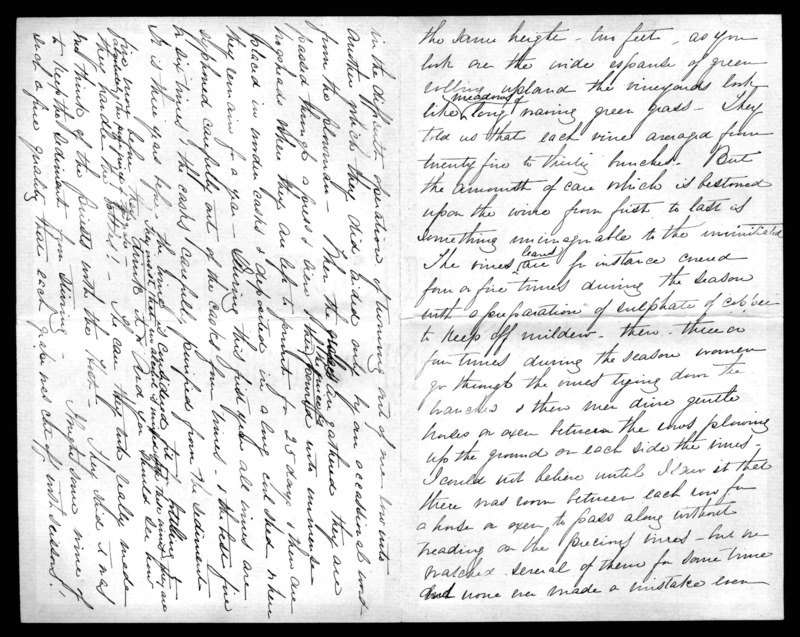 That the 1797 bottling may have been “an isolated experiment, and that for the next half-century bottling was by Bordeaux and by English merchants.” Mabel Hubbard Bell wrote that there were sample bottles “from each years vintage beginning with the year 1798.” Could Mabel Hubbard Bell’s samples represent chateau-bottled Lafite albeit in small amounts? Could the 1797 vintage lying in the vinotheque be the same at Mabel Hubbard Bell’s sample bottle of 1798? What happened to all of the other sample bottled vintages?